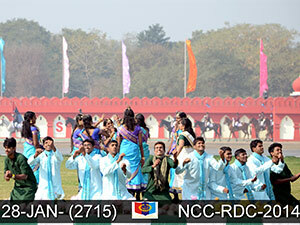 “SPIRIT OF ADVENTURE"- An army wing of the NCC is molding the cadets with discipline, character And leadership. A unit of senior division NCC (infantry) is attached to this college. There were 33 Cadets (24 boys and 9 girls). LT. Thomas Scaria, who was serving as the NCC Officer of the NCC unit, completing his Pre Commission Training Course, taking place at Officers Training Academy Kamptee, Nagpur and assumed charge as Associated NCC officer on October 2012. The NCC units of the college conducted a variety of programmes this year. The activities were carried out under the dynamic leadership of Senior Under Officer. 18 new cadets were enrolled in this year. The training activities were started by hoisting the National flag on 15th August 2013. 11 cadets are preparing for ‘C’ Certificate Examination. 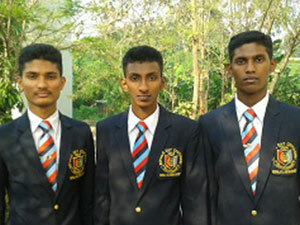 3 Students In RDC Delhi, Albin Johnson, Alwin K.J and Nirnal Justin Joseph. 2 Students in NIC Delhi, Martin Kuruvila and Sarath Sasidhar.